One of the most exciting and profitable ways of investing is trading in Forex currencies. In today's financial world, you're able to trade different asset classes from the comfort of your own home. The hard part is finding the right broker to process the trades you need to make at the time you need to make them. The overwhelming list of available Forex and CFD brokers can be very challenging, especially for newbies, that's why it's very important to reduce your options only to a handful of quality brokers. Going forward, we're going to discuss the selection process of your personal Forex and CFD broker and what factors you should consider when choosing a Forex broker. 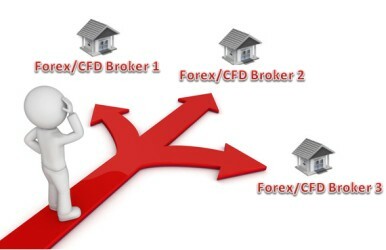 Regulation is probably one of the most important factors to be taken into account when choosing a Forex or CFD broker. Since most Forex trading is done outside an exchange on the OTC market (Over The Counter) the retail trader is relying on the creditworthiness of the Forex broker. A proper regulated broker by a competent regulatory body will ensure you that your broker is adequately capitalized and your money is protected. In the UK we have the FCA, one of the most trustworthy regulatory bodies in the EU. In the US we have the NFA and CFTC, which are the authorities that supervise the US brokers. If you're trading with a Forex or CFD broker that is not regulated you have to accept that as a risk because there are many unknowns. It’s important to do the research on each Forex or CFD broker you're doing business with and only trade through a properly regulated broker. You have to be aware that there are two different types of Forex brokers: dealing desk and no dealing desk. The dealing desk broker is also called a market maker because they create an artificial market for their clients, they offer you fixed spreads, but at the same time, they also take the other side of your position. With this type of Forex brokers, there is obviously an inherent conflict of interest as every time you lose the broker makes money. On the other hand, a No Dealing Desk broker simply acts as a bridge between the trader and the liquidity providers. There is no conflict of interest and you’ll be charged either a variable spread or a commission fee. It’s important to make an educate choice and choose the Forex or CFD broker that fits your needs and the one that ultimately will cost you less. Your trading platform is the interface that allows you to communicate your trades to your broker and it is the gate that will give you access to the Forex trading world. In this regard, the trading platform needs to be user-friendly, but at the same time, it needs to be complex enough to satisfy all your needs. A good trading platform is customizable so that you can change the platform to your own trading needs; it has different order types; different entry types; customizable charts; a variety of technical indicators and last but not least, a good trading platform offer you with the necessary tools to automate your trading strategy. A good customer support is imperative, especially since the Forex market trades around the clock. Your broker needs to be available at any time during the trading hours. Your trading platform can be disconnected for various reasons, so being able to call your broker's dealing desk to manage your trades can save you a lot of money especially in fast moving markets. Try looking after those brokers that assign personal account managers because it really shows that the broker cares about their customers.